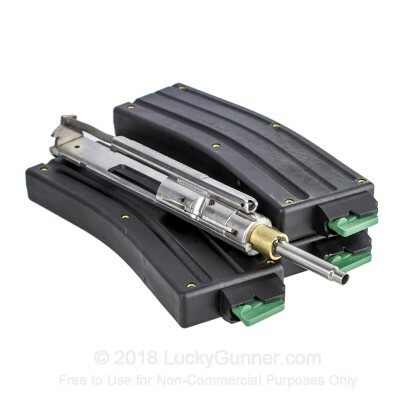 For gas-operated AR-15's, simply remove your bolt carrier group and insert the conversion bolt and feed the .22 LR rounds with the included CMMG .22 LR Magazine. This conversion takes less than a minute with no permanent alterations to your firearm. It can quickly and easily be returned to its original caliber. . . . and the best part is that it is STAINLESS STEEL and very easy to clean! For piston driven AR platforms, there is one additional step required. Remove the screw that holds the piston rod in place and the piston rod will fall out of the front of the gas block. This will allow the kit to then fit into the rifle and it will operate off of the blow-back from the .22 round. This kit comes with three 25 round magazines included. Bought it to be able to train / practice on the cheap. works great ,keep it clean and lubed and it works fine. Only hiccup I experienced was with the magazines . As long as I didn't load them to capacity (25rds) they functioned fine. Maybe they need to be broken in more. Always had good experience with CMMG products, and this one is no exception. Q: Will this work for an M16 A2?